It’s been a while since a solid game based on vampires has graced our screens. Developers Dontnod does just that and quite well. Vampyr is dirty, gloomy, and dark in all the best ways. It has a great setting and interesting story and is only slightly marred by some lackluster gameplay elements. In short, if you like vampires and historical settings you’ll love Vampyr. The year is 1918. London is just as dark and dreary as is usually portrayed in media. It’s shortly after the first World War has ended and there is a plague spreading through the rundown streets. Two plagues in fact. The Spanish Flu epidemic is in full force, wiping out people left and right. Underneath all that is another plague. One of more supernatural origins. You play as renowned doctor Jonathan Reid. And you are a newly turned vampire. Vampyr wastes no time in establishing a historical setting that is on the brink of collapse. You’re in the thick of it right away, trying to figure out how to stem the flow of death from both plagues and find out who gave you this sudden affliction. Finding the vampire who turned you drives the story and all the other characters are part of your journey there. Interactions with the other characters are what you’ll spend the majority of your game doing. Talking to different citizens, gathering information, and solving problems will take up the majority of your time. In other words these are where the bulk of your quests come from. On paper, this sounds like a bit of a drag. I will admit it does get tedious at times but the personalities of these characters make up for it. The writing is one of the strengths of Vampyr by far. Which shouldn’t be a surprise considering Dontnod’s track record for story driven games. There are four main sections of the game, each with their own set of characters. They are all different and have their own desires and personalities and really bring life to the game. No pun intended. And they react to what responses you pick at key moments. Interactions with these characters has a fluidity I haven’t seen in a game for some time. On a deeper level I feel like Vampyr also touches the idea of class and how it can change people’s lives for better or worse. You’ll talk to all kinds of people with different backgrounds and upbringing. You’ll interact with the lowest of low all the way to privileged aristocratic people. Even Reid himself, although a bit dull, is affected by his position as a well-known doctor. However, the amount of time spent talking with people and learning about them is a double-edged sword in this case. While it’s great for bringing characters to life and fleshing out the world of London, it does take up a lot of time. You will spend a big chunk of your playing time talking to different citizens. Many times over sometimes. For me this wasn’t enough to ruin the experience though. I enjoyed the well thought-out and well written characters. There is a reason for all this chit-chat. All the citizens can be fed on by you if you so choose. If you feed on a citizen you will get a large amount of xp. Which can then be used to upgrade your abilities. You can get even more xp by bringing their blood quality up. This can be done by helping people, discovering new hints about them, and you do that by, you guessed it, talking with them. There is, as always, a downside to feeding on citizens. If you feed on too many citizens the district may start reacting to you differently. The overall health of the district can fall and as it does, the area will reflect that. If it gets bad enough, enemies will start showing up and the people will start reacting negatively towards you. But this also makes the game a bit easier for you since there are fewer people. This aspect of the game is the main backbone of the Vampyr. The choices you make here (whether to feed on a citizen or not) can drastically change how your game plays out. It is entirely possible to play the game without feeding on anyone but you will get far less xp. Which makes some sections of the game very challenging as you’ll have to depend on actual skill or lots of grinding. Vampyr is one of the few games that I felt like my choices really affected the world I was in. My decisions were reflected, sometimes drastically, in the reactions of citizens and how the difficulty changed. It was more a scale than a good or evil concept. You could get away with feeding on a couple of people but much more than that and the scales would starting tipping. As you play the game and earn xp you can enhance and learn new vampiric skills. Similar to Skyrim, you level up when you sleep at a safehouse. This is also when the districts can shift depending on your actions. But before that you can spend your xp on new skills or level up ones you already have. There is a decent range of abilities in Vampyr that will compliment how you like to play. There are several different abilities you can purchase such as a Blood Spear which shoots out a spear of blood and takes a decent chunk of damage. Or Shadow Veil which allows you to turn invisible for a period of time. You can also use xp to expand each skill even further by leveling up the skills. For example, you can level up your Big Thirst skill which effects how much blood you take from enemies when you bite them. Which is very helpful since you use blood for your active skills. All in all it’s a pretty simple but effective skill tree and leveling system that I found complimented your vampiric powers quite well. They were also diverse enough to give you the ability to play the game in several different ways. As you may have guessed, when you aren’t talking it up with the locals you’re in a fight for your life against brutish vampires and sharp-eyed vampire hunters. When you venture away from the central areas of the district you’ll find several different kinds of enemies to fight. While there is an interesting variety of enemies (human hunters in particular have an interesting selection of different types) and you’ll face several bosses through your playthrough, the battle system is probably one of the weakest aspects of Vampyr. Whether you decide to feed and boost your skills or level up as you fight, you’ll notice that battles start to get pretty boring fairly quickly. The game starts strong as you’re learning new skills and get the hang of the mechanics. Starting out, you really do feel like you are a powerful supernatural being. But lack of variety in enemies and how you fight them eventually brings it all down. Once you figure out how to fight well, you’ll pretty much use the same tactics for everything you come across. Some enemies take different strategies but overall they are all too similar and unfortunately fighting was not a big highlight of the game for me. This system is an interesting one to say the least. Everything is intertwined with each other. Feeding on citizens nets you a ton of xp (especially if you bring their blood health up first) that you can then spend on your skills but people will start treating you differently and the districts will become more dangerous. On the other hand not feeding on anyone (along with helping people) makes districts safer for you but makes combat with enemies a little tougher since you don’t get quite as much xp and thereby less skills. Unless you grind a lot. Boss fights in particular can be pretty tricky with this decision. It is difficult but not impossible to get through the game without feeding on one citizen though. But you will have a lot more work on your hands. If you compare Vampyr to previous games that give you choices this game may seem a bit lopsided. In a way it kind of is. You may ask yourself if it’s worth it to not feed on anyone. It all comes down to how you would like to play. Vampyr is one of the few games where your actions have consequences that can be felt and seen. You can go through the game eating everyone, no one, or just a few people and see how it affects the world and the difficulty of the game. While the systems of the game will take precedence of your experience with Vampyr, the rest of the game is not without their merits. Both the music and the visuals are the sugar on top so to speak. The graphics look good. There is a lot of detail in the environments that really help with immersion and characters all look distinct if a bit wooden at times. It all ties in with the setting in a believable way though. You are in a very run down part of the city that is seeing some bad times and the environment does a great job of portraying that. The hospital in particular tells you things aren’t going all that well before you even talk to someone. Overcrowding and messy rooms tell a story all on their own. The soundtrack is a mixture of authentic music from the time period with some newer sounds and instruments mixed in. It was odd at times but worked well in adding to the vibe of the game. It’s authentic but also adds in a modern touch. Which I can definitely appreciate. Overall I really enjoyed my time in Vampyr. It has an interesting story and well written characters that kept me playing through. Even with some less than stellar battles. The setting is fantastic and is quick to draw you in with great atmosphere. The choices in this game tend to have a more obvious and personal impact even if the story pretty much ends at the same place. Seeing your actions have real effect on the world was a treat. 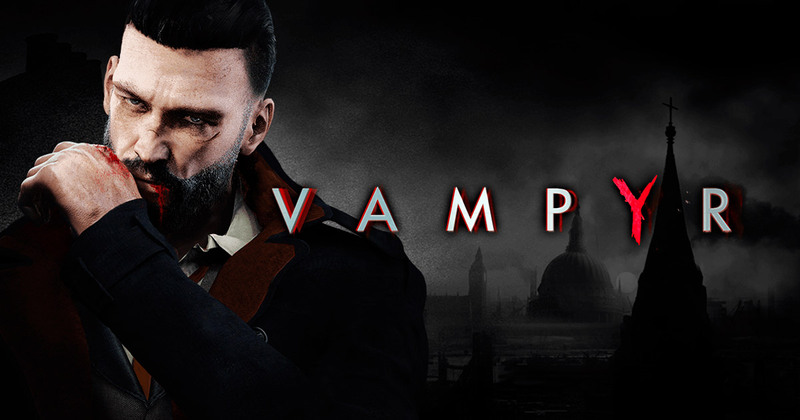 Overall, if you are into vampires, history, well written stories, or all of the above, do yourself a favor and check out Vampyr.